D&D Daily Exclusive - $15M Nationwide multiple fencing operations busted with Florida based booster network that fed stolen merchandise as far north as NY. and Mi. In an 18 month investigation Miami-Dade County state attorney's office along with law enforcement authorities, the Miami-Dade Organized Retail Theft Task Force and ORC investigators from Walgreens, Publix, and CVS conducted 5 a.m. raids this morning and arrested 16 suspects for organized retail theft in 'Operation OTC' with another 7 outstanding warrants for suspects they expect to be in custody within 24 hours. 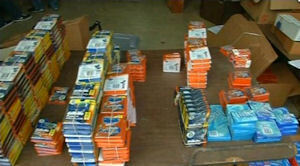 The operation focused on multiple fencing operations that distributed stolen merchandise as far north as New York and Michigan. With one suspect currently being hospitalized and as this writer was informed by a confidential source, one having committed suicide and another barricaded themselves in their home until surrendering to police. This 18 month investigation continues as the conservative estimate of the case being valued at over $15M will obviously grow as more suspects are identified. With numerous distributors moving goods in multiple states the network of boosters is obviously larger as well. There's no evidence of any other gate-way crimes or drug trafficking involved at this point. This morning at the 5 a.m. raid it was learned that authorities stationed at one fencing operation arrested suspects as they showed up to sell their loot. This was a great effort on the part of all of the investigators involved and the Miami-Dade Organized Retail Theft Task Force. Stay tuned tomorrow for more details!